Experienced registered nurses who help navigate treatment. Met and assisted 1,197 patients in 2014. Provide a gold standard of holistic care. "Having a nurse navigator meant the world to me. I don't know that I could have done it all without her!" What will my nurse navigator do? Your nurse navigator is your go-to person and advocate for anything to do with your diagnosis, treatment and recovery. She will help you navigate treatment at no extra cost. Make sure you understand your diagnosis and treatment. Come up with questions to ask your doctor and explain answers. Ease the transition into survivorship. Kelly helps diagnosed women navigate the health care system, providing much-needed support. She has a particular empathy for her patients, because she's a breast cancer survivor herself. "I've been given a special gift to be able to share what I experienced with other diagnosed women." Libby serves as a resource for cancer patients and their families, and knows the fear and frustration of a cancer diagnosis—both her parents are cancers survivors. 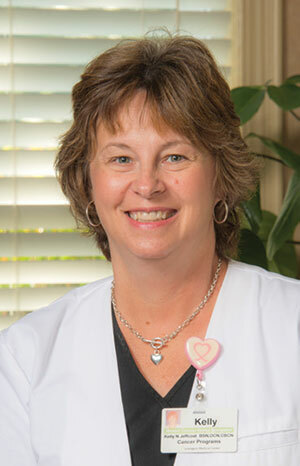 Libby is a recipient of the Oncology Nurse-APN/PA Oncology Nurse Excellence Award. 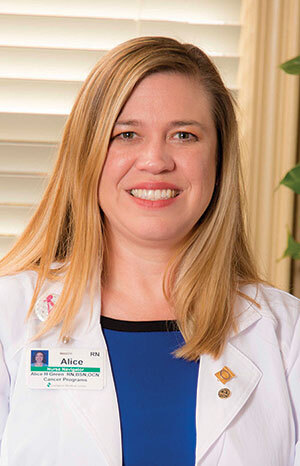 Alice is dedicated to educating patients about their diagnoses and empowering them with information throughout their treatment. 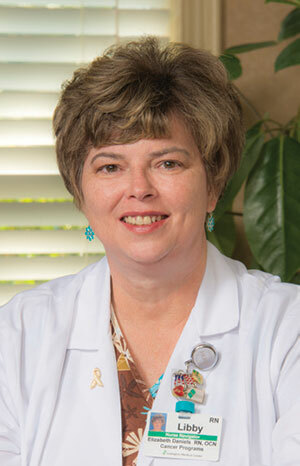 Alice is a member of the Oncology Nursing Society and Riverbanks Oncology Nursing Society.